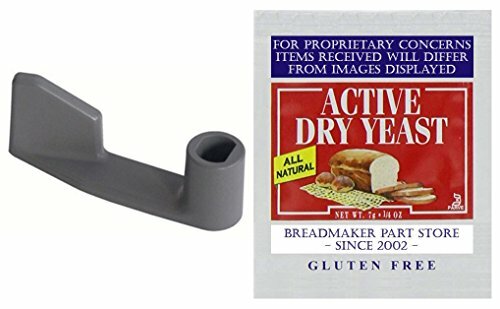 New Kneading Paddle Fits Hitachi Model # HB-B101 Automatic Home Bakery Vertical 1.5-Lb Breadmaker. Aftermarket Replacement For Discontinued OEM Factory-Original Part Pictured. Bundle Includes Fresh Packet Of Active Dry Yeast. For Reasons Of A Proprietary Nature Items Received May Differ From Images Displayed. Hitachi HomeTec HomeTech Limited Ltd HitachiHomeTec HitachiHomeTecLtd HitachiHomeTecLimited Hitachi Automatic Home Bakery HitachiHomeBakery HitachiAutomaticHomeBakery HitachiAutomaticHomeBakeryHB-B101 HBB101 HBB 101 HB B101 HBB-101 HB-B101. Attachment Automatic Axe Axer Axing Bar Beat Beater Beating Bit Blend Blender Blending Device Hook Feather Hammer Hook Impeller Implement Knead Kneed Kneeder Kneeding Making Mash Masher Mashing Mix Mixing Part Peice Piece Pound Pounder Pounding Prop Propeller Push Pusher Pushing Rake Raker Raking Replacement Rod Rotate Rotating Rotator Rotor Rotary Screw Shovel Shove Shover Shoving Spatula Spare Spin Spinner Spinning Stir Stirrer Stirring Thingy Tool Wand Wing. Manufacturer: For Reasons Of A Proprietary Nature Items Received May Differ From Images Displayed. Publisher: For Reasons Of A Proprietary Nature Items Received May Differ From Images Displayed. Studio: For Reasons Of A Proprietary Nature Items Received May Differ From Images Displayed.